Compass Keyring Pack of 3 | BUDK.com - Knives & Swords At The Lowest Prices! 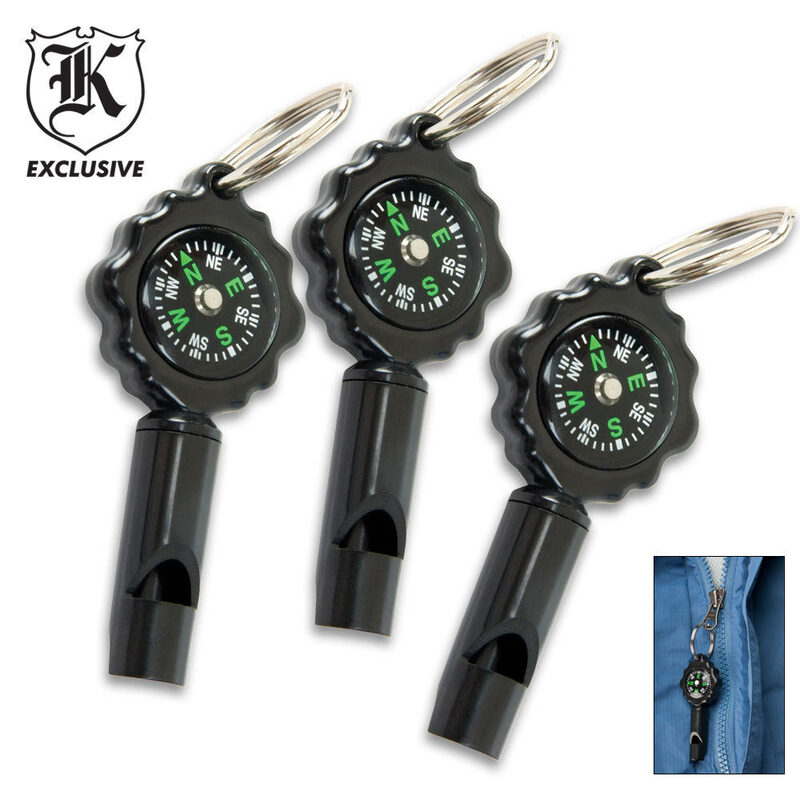 This two-in-one Camping Compass Whistle is the perfect handy tool to have! This keyring features a compass and a whistle. Each order comes in a set of three. Each compass whistle measures 2 5/8" (not including the key ring). I bought six of these for my grandchildren age three to 14. I am teaching them how to,use them, including removing steel from the area. When I checked them out, they all worked and pointed to North together. The whistle is loud and annoying, just like you want if you're lost. These will be a back-up unit, clipped to their packs, not their primary compass. I am a regular purchaser from Kennesaw, and have always been happy with my purchases, shipping and service! My dad gave me one of these about a year ago and I have never used it until I was on this website here and read the review stating that the compass doesn't work...well here's the deal...mine was the same as described in the other review, but knowing its a magnetic compass attached to a steel keychain ring, I removed the steel ring and found that the compass works fine. I had to slightly rock the compass a little to get it to settle on true north but it does work (when not close to steel) I ran a piece of paracord through mine instead of the steel ring and it works fine. They are worth the price for sure, just remember to get rid of the steel ring! OH and the whistle is loud for sure...made my neighbors barking dog shut up too lol. FIRST LET ME SAY I'M A CONTINUOUS BUYER FROM THIS COMPANY AND WILL CONTINUE TO BE. I GOT THESE WHISTLES KNOWING THAT THEY WERE CHEAP AND WOULD BE SMALL. THE WHISTLES ARE FAIRLY LOUD BUT NONE OF THE COMPASSES WORK IN ANY OF THE 3 WHISTLES. THEY ALL CLAIM NORTH IS IN A DIFFERENT DIRECTION. BETTER OFF GETTING A REAL COMPASS.